Our match of the week this week goes to 2 players who saved their best for the last week of the season. 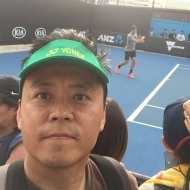 Paul Kang (pictured) taking on Samuel Oranyeli in division 1 of our Parramatta Tennis League. After a titanic 3 set battle Paul managed to come out on top. Samuel took the first set 6-3, but Paul bounced back in the second to take it 3-6 forcing the game to a third set champions tie-break, with Paul taking it out 10-2. A great victory, and with it Paul secured his place at the top of division 1 and a grand final spot. Just because the regular winter season is all wrapped up, this doesn’t mean you can’t get on the court. Feel free to contact other players from your player directory to organise friendly matches in the off-season. Regular competition is a great way of improving your game and getting ready for the new season. Register for our new season for just $5! Registering for the spring season couldn’t be any simpler, one quick step and you’re in. For the upcoming spring season we are running a one-off special registration for just $5! This offer is only available to existing players. It’s our way of saying thank you for joining Oz Tennis Leagues and for making the community what it is. It should also mean our spring season will be busting at the seams, meaning lots of great divisions and lots of close match ups. To register for just $5 use the promo code ‘SpringSpecial‘. This offer is only available to existing players and only until the 30th September. You can register here now.